Have you ever really tasted a perfect apricot? Oftentimes, the flavor might be good, but the texture might be dry and mealy. Sometimes, the fruit is juicy, but the flavor is weak. However, Frieda’s Specialty Produce wants fruit lovers to know that the perfect apricot does exist, and it’s called an Angelcot®. This elusive white-flesh apricot is grown in Central California and has a limited season, but those who have the opportunity to taste the Angelcot® will tell you that no other apricot compares. We are shipping these beauties to select supermarkets around the country this week. 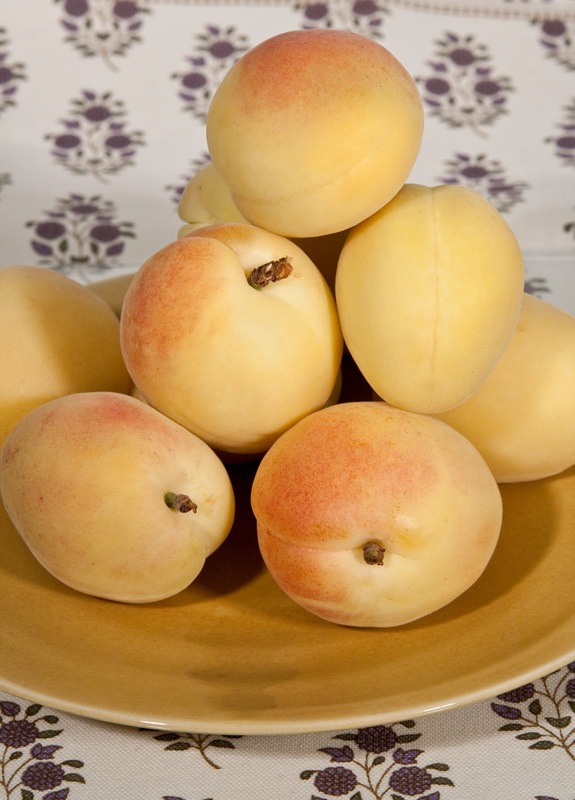 Angelcots® are a specialty hybrid of Moroccan and Iranian apricot varieties. There are only a few acres of this special fruit in the world. 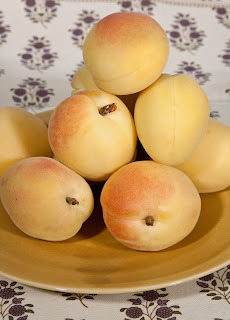 They have a very pale yellow skin color with a pale peach blush and a very fine velvety fuzz. The inside flesh is extremely juicy with the texture of a perfectly ripe nectarine with the delicate yet intense sweet flavor of an apricot. These tree-ripened, hand-packed fruits are as close to divine as a fruit can be. Angelcots® are much juicier than a typical apricot and possess a beautiful balance of acid and sugar with a buttery, tropical, perfume-like sweetness. You haven’t tasted an apricot until you sink your teeth into a heavenly Angelcot®! This simple no-bake tart is a great way to showcase the natural sweetness and juicy texture of white-fleshed apricots. Mix the cream cheese, raspberries and sugar in a medium bowl and beat with an electric mixer for 2 minutes, until smooth. Spread over the pie crust and arrange the Angelcot® slices decoratively over the top. Melt the raspberry jam in a small saucepan over low heat. Spoon over the peaches. Refrigerate at least 2 hours before serving. Connect with us on Facebook and Twitter to find out if a market in your area will have the Angelcots(r). But act fast, because the season is short!